All additional pages will include summaries of specific charges for each service. All invoices are released on the 1st of every month in all formats. Postal invoices are all sent from Sydney and take on average 2-3 business days to be received. If you are in rural country area you may experience longer delays in post. A $3.50 charge will be included on any invoice issued by post. Itemisation of individual calls is only available online at our user self-help system. No charges are applicable for the issue of email and online invoices. To gain access to the online system you must contact TeleMates on 1800 777 055. TeleMates will always issue an invoice on the 1st of every month (including weekends and public holidays) with a due date of the 14th of the same month. Each invoice will include any calls/charges for usage in the previous month plus any additional charges that may have been missed in the previous 6 months. Monthly Access Fees and Service & Equipment charges are always charged for the month in advance. If you connected any service midway through the month a once off pro-rata charge for the time connected will appear on the next invoice plus a full monthly charge. Any special discounts or offers will be included and itemised on the monthly invoice. • Credit Card: Call our office on 131501 or enter your details in the form below. One off payments can be made from a credit card. Automatic payment from a credit card can be set up on the due date by authorising this over the phone or requesting a direct debit form. 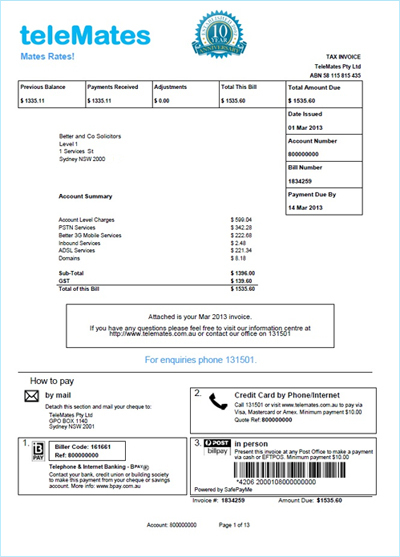 • Australia Post Payment: Make payment over the counter using CASH or EFTPOS at your local post office using the barcode on the front of your invoice original invoice. A $2.50 administration fee is charged by Australia Post for this service and will be added to your next TeleMates invoice. Please note this service is provided by SafePayMe.com and will display SAFEPAYME as you pay at the Australia Post counter. Credit card is not available over the counter at Australia Post. • Cheque: Send all cheque payments to TeleMates Pty Ltd, GPO Box 1140, Sydney NSW 2001. Please make all cheques payable to TeleMates Pty Ltd and ensure your account number is included. Note: Telemates does not charge any additional merchant fees for payment of telecommunication services using Credit Card, Direct Debit, B-pay or Cheque. you will need to fill out a transfer of ownership forms. This will ensure the Phone/Internet services are maintained using the same telephone numbers. A new account will usually be open in our billing system under the new owners details. If you are only changing contact people on the account such as when an employee leaves your business, you will not need to fill out a transfer of ownership form. You will simply need to add the new employees as contacts on the account. The transfer of ownership forms can be downloaded here. Please note that both the original owner and previous owner will be required to sign these forms. If either party does not sign these forms then the account will remain in the original owners name and they will continue to incur charges. The transfer of ownership will commence within 24 hours of the forms being returned to Telemates. If you provide the transfer forms late after a business is sold, then the charges will remain on the old owners account until the forms are received. A transfer of ownership cannot be backdated in time. It’s best to have these forms ready to be signed at the time of business exchange.